Of all the different kinds of apps that I regularly use on my iPhone, I probably spend the least amount of time with weather ones. That’s not to say I don’t like them, quite the contrary: I’ve downloaded so many of them over the years, I could probably go a year without needing to open the same one twice. But no matter which one I’m using, my time with it is relatively brief—I check the temperature, maybe scan the forecast, and close. 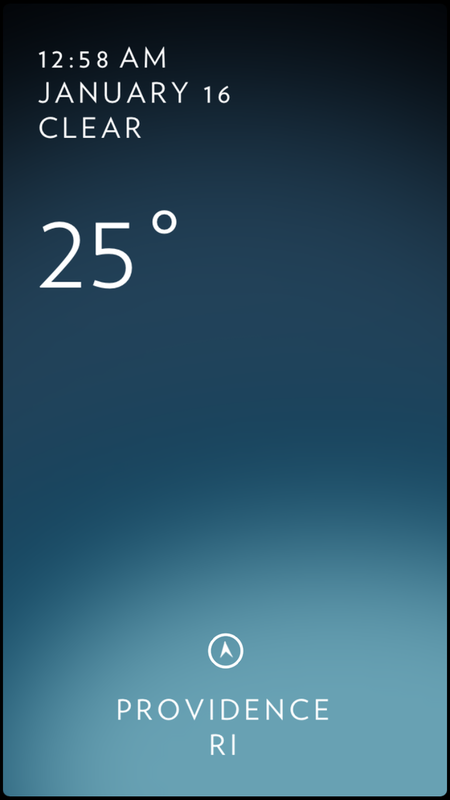 Therein lies the beauty of a great weather app. Unlike note-takers or Twitter clients, weather apps aren’t designed to be used for any substantial length of time. Unless you’re obsessed with all things meteorological or happen to enjoy poring over a month’s worth of barometric readings, the data is actually secondary to the experience. More than any other category in the App Store, there’s quite a bit of overlap among weather apps, but while they all pretty much do the same thing, the interfaces and experiences vary widely. That’s why picking the best one is so difficult. With virtually every other task I need to do on my iPhone, I have a clear favorite. Tweetbot for Twitter. Daedalus Touch for writing. Fantastical 2 for day planning. But weather apps are far more subjective; on my own device I cycle through a couple dozen apps on a relatively regular basis—and that’s before I started testing them for this article. So, to help narrow things down, I set some criteria. First and foremost, current conditions have to be accessible at a glance. More often than not I’m popping into a weather app to see what’s going on right now, so I don’t want to spend any time searching for the pertinent information. An iPad companion helped but wasn’t necessary, but they did have to offer a five-day forecast, along with at least some kind of detailed information, such as radar, precipitation or wind speed. And above all, they had to be accurate. Accuweather’s good looks are nothing compared to its big, beautiful brain. This wasn’t an easy decision—and some of you will undoubtedly disagree with me. 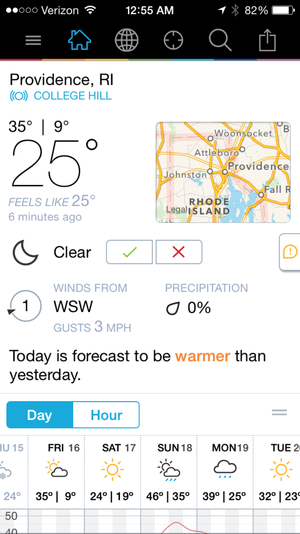 Accuweather Platinum ($4) set off an avalanche of criticism when it got an extreme iOS 7 makeover, but a year later it’s all the better for it. A quick scan of its reviews will show you that it still has its detractors, but Accuweather has continuously tweaked and refined its vision to deliver an app that’s both minimal and meticulous, drawing an utterly exhaustive picture of the sky above you. There’s a ton of information crammed into the app’s modular interface, but none of it gets in the way of the current temperature and conditions, clearly displayed against an animated representation of what’s going on outside your window. Any warnings or advisories are positioned at the top of the screen, but scroll a bit down and you’ll find a wealth of customizable weather stats, from commonplace figures for visibility, pressure and dew point to more unique features like hourly precipitation forecasts to the phase of the moon. Clicking on most segments expands them to show a greater level of information, including a very useful plain language description of the forecast. 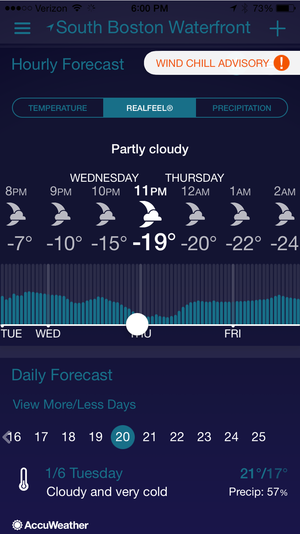 Accuweather’s array of forecasting tools leave no stone (or cloud) unturned. 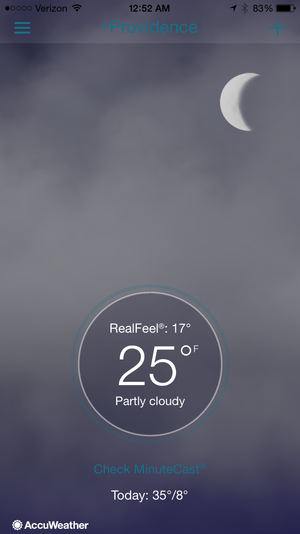 But what really sets Accuweather apart is its MinuteCast. Accessible on the main screen, it offers a forensic look at the next two hours, as it literally lets you know the exact moment you’ll need an umbrella on your 30-minute walk. Gesture-based and extremely accurate, it blows away any other app I’ve used for live tracking. My only real complaint is that it takes a second or two longer to load than I’d like. We’ve become spoiled with instant-on apps, and Accuweather takes a moment to refresh its screen each time it’s launched, occasionally displaying incorrect information while it loads. And if I really want to quibble, the purple-and-blue color scheme can be difficult to read in spots. But overall, it’s a fantastic weather app, and if you’re one of the people who ditched it out of frustration after its initial re-launch, you’d be well served to give it another shot. 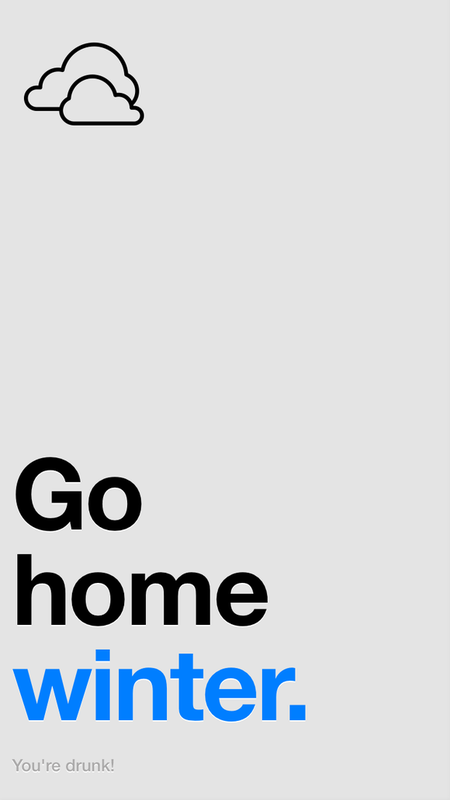 Dark Sky isn’t nearly as much fun if it’s not raining, but don’t worry, it’ll direct you to someplace where it is. Most of the time I check a weather app I want to know one thing: When is it going to rain? Dark Sky ($4) is the only app I’ve used that puts all of its efforts specifically into answering that exact question. It’s so good at what it does, I rarely need to open it anymore—notifications dutifully keep me apprised of when the wet stuff is on its way—but when I do, I find myself using it differently than any other weather app. That is to say, I spend a considerable amount of time with it, even after it gives me the information I seek. And while most every other weather apps focuses on a few locales of your choosing, Dark Sky encourages you to explore parts of the world you’ll probably never visit. If there’s no precipitation near you, the app will suggest an area where you’re sure to find some, giving you an excuse to play with its stunning interface. Like a Wikipedia wormhole, once you start, you won’t want to stop; Dark Sky sports one of the most beautiful and mesmerizing radars I’ve ever seen on an iOS app (or anywhere else for that matter), and it’s as much of a joy to use as it is to behold. Seasonality has forgotten more about weather than most apps will ever know. Most of us only check weather apps to see the temperature and precipitation forecasts, but those who want to go beyond even the atmospheric readings that Accuweather provides should check out Seasonality Go ($6). Chock full of more charts and data than one could ever possibly need, the app’s bustling interface can be a bit daunting to casual weather buffs, but if you take the time to explore it you won’t be disappointed. The main screen (which is customizable on the iPad) displays an excellent cross-section of the current conditions, including air pressure, dew point, and the coolest astronomical chart I’ve ever seen. You’ll also find graphs for a wide array of information, including wind speed, snowfall cloud cover and wave height, as well as a powerful radar map with live satellite overlays, barometric pressure lines and a hypnotizing Particle Mode that shows exactly how the wind is blowing. Gaucho Software has been promoting an upcoming “Pro” version of Seasonality built specifically for the iPad, but quite frankly, the one currently available is already more advanced than most every other app I tested. 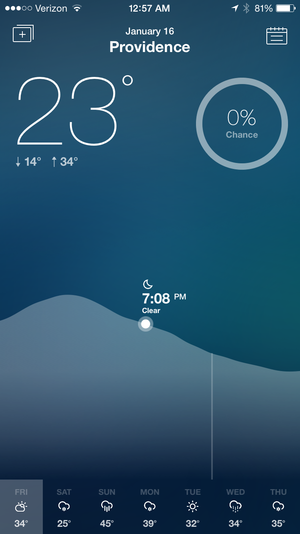 It won’t fit everyone’s tastes, but those looking for an in-depth look at the weather on their iOS device should definitely check it out. Weather Underground is the next best thing to having a Doppler radar in your backyard. Let’s just call Seasonality Go and my next choice, Weather Underground (free; $2/year subscription to remove ads), a tie for all meteorologists out there. Weather Underground brings the same remarkable and exhaustive online system of crowd-sourced weather measurements to its iOS app, and there’s more than enough within its digital walls to keep the most die-hard of weather junkies extremely happy. There’s so much information here that some screens can get a little overwhelmed (the iPad counterpart, WunderStation, does a much better job with layout), but the customizable interface does a nice job of keeping things in order without sacrificing any of its usability. Drawing live readings from some 40,000 weather stations around the world, Weather Underground shuns the usual services and radars to present the most localized and comprehensive forecast around. Fans of the service will be pleased to know that its interactive WunderMap is on full display here, with a complete array of buttons to show radar, temperature, precipitation, fronts, webcams, and anything else you need to know, including any active fires or brewing hurricanes. While it’s better for current conditions than forecasting, the sheer breadth of its weather reporting is simply outstanding, and I defy you to find a weather app that’s more exhaustive or accurate. It looks like a video game, but Weathertron actually tells you a lot about the atmosphere. The Weather category of the App Store isn’t without its share of funky yet functional interfaces, but of all the ones I’ve tried, Weathertron ($2) is the farthest out there. That’s not an insult (and if it was, I never would have created this category)—Weathertron sets itself apart as one of the most fascinating apps in the App Store, drawing you in with its beautiful design and practically challenging you to figure it what its bars and gradients are trying to telling you. 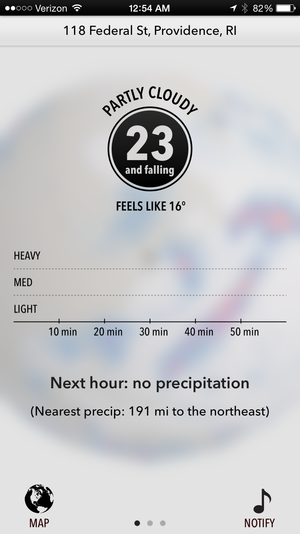 As much of a live infographic as it is a forecasting app, Weathertron doesn’t just tell you the conditions—you’ll quickly see the temperature and a general overview of what’s outside, but it takes a bit of a close study to understand how to read its hourly breakdown of the day’s cloud cover and precipitation. Even after you grasp it, however, there’s nothing casual about Weathertron, and that’s what makes it so great. 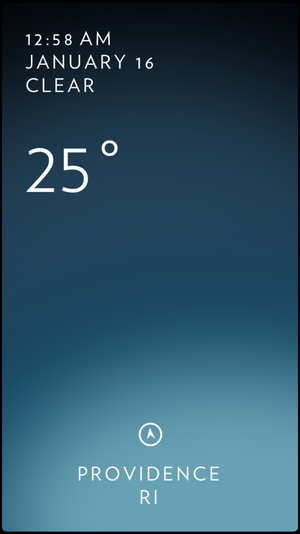 Sure, the fluid nature of its UI can get frustrating at times, but you’re unlikely to find a more stimulating weather app out there. Weather Cal’s slick interface is bolstered by a tight integration with your Calendar appointments. New and interesting weather apps are constantly popping up, and with such stiff and varied competition, it can be hard to get noticed. 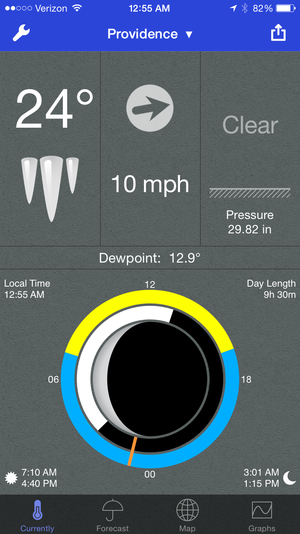 But Weather Cal ($3) is off to a great start—and I felt it deserved some recognition here. More than just another pretty face, the app is something of a personal meteorological assistant, incorporating your Calendar events into its forecast for a complete picture of the week ahead. 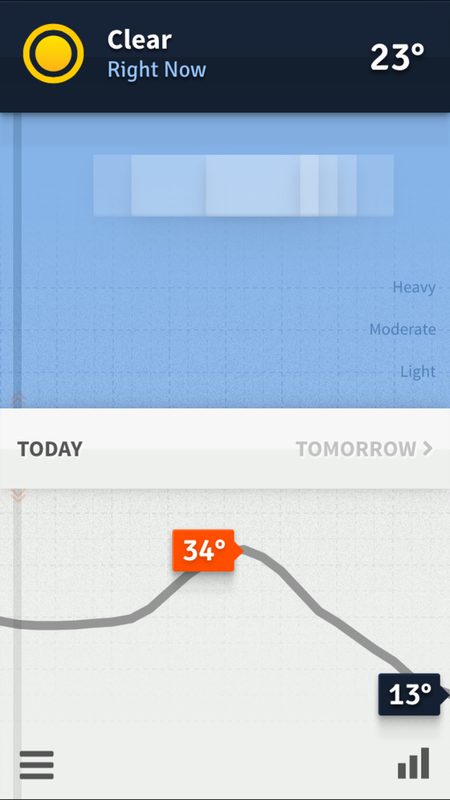 Weather Cal’s interface is as thoughtful as its concept, with a muted background color gradient that changes to reflect the current position of the sun. Dragging your finger along the curve at the bottom of the screen gives you a minute-by-minute forecast of the next seven days, and you’ll get some detailed stats by tapping the precipitation circle at the top right. The Calendar integration isn’t quite as smooth as it could be—accessible via a separate screen that doesn’t have the same polish as the main interface—but it’s an example of the attention to detail that helps make Weather Cal an especially strong candidate even in such a crowded field. Solar uses simple colors to tell you how much sun you’ll see today. Actually, crowded field might be a bit of an understatement. Even if you’re not interested in any of my selections, you won’t have to look too long to find a capable and competent weather app that fits your budget. At the free end of the spectrum, there are numerous ad-supported apps out there, the most decent of which being The Weather Channel and Yahoo Weather. Both feature very nice interfaces and detailed stats that tastefully work ads into their designs without relying on unsightly banners. Also free (with an annual $3 in-app subscription to remove ads) is the very popular (and very cluttered) WeatherBug, but if you’re looking for something a whole lot more minimal, there’s the exquisite Solar. You’ll have to forego common data points like humidity, wind speed and precipitation, but what you get in return is a brilliant impersonation of the sky above you. As you slide your finger along the screen, the color gradually changes to reflect the position of the sun, turning your phone into a brilliant color-scape that’s like looking through at a living abstract painting. Make sure the kiddies aren’t around when you use Authentic to check the weather. Take a few bucks out of your wallet and your options will greatly expand. For minimalists, there’s Shade ($2), which boils the forecast down to a mélange of simple colors and lines in a surprisingly cogent UI. Another personal favorite is Weather Line ($4), which offers a clean and simple interface that plots temperatures and precipitation on an interactive graph to illustrate daily, weekly and monthly trends. 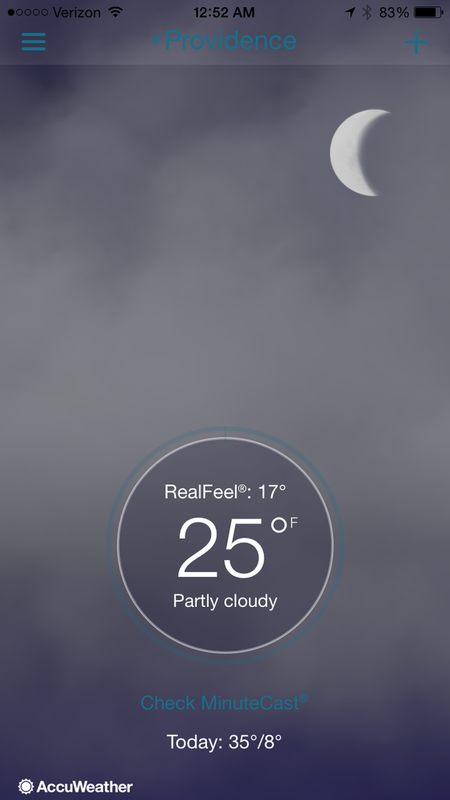 Finally, I would be remiss if I didn’t mention Authentic Weather ($1). 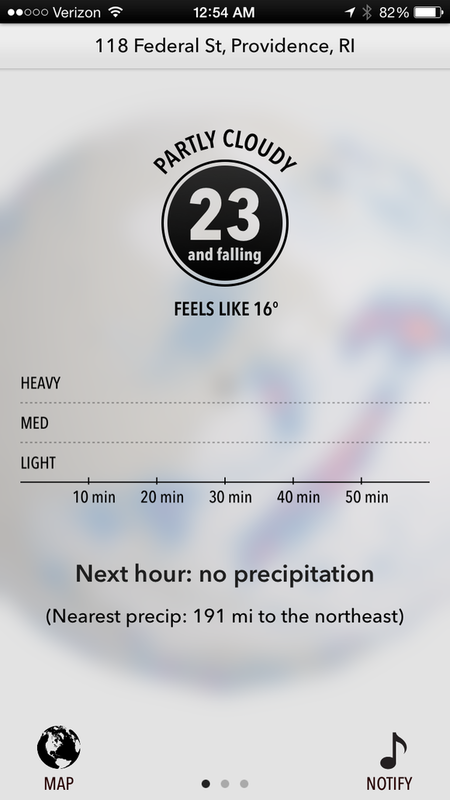 Easily the most irreverent weather app on any platform, it eschews everything about forecasting and plainly tells you what’s going on outside using, shall we say, rather colorful language. You could always look out a window to get the same results, but Authentic’s naughty attitude is way more fun.